This Adelaide Bottle Shop – Booze Brothers @ The Unley is located 5 mins from the Adelaide CBD at Parkside. Love beer? So do we. With over 200 craft beers in stock and a wide variety of boutique wines and spirits, you’re sure to find what you want at this Adelaide Bottle Shop, at a pretty good price. Come check our wide range and make sure you have a chat to our friendly staff. They might show you a thing or two about your favourite drink and other options that you might like too. 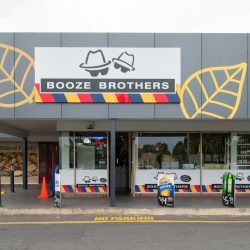 Booze Brothers is a South Australian independent bottle shop retailer and has been operating since 1985. We pride ourselves in quality customer service, product knowledge and premium beer, wine and spirits range in both our bottle shops and hotels. While you are visiting the Unley Bottle Shop pop into The Unley, an Adelaide pub with a welcoming bright and airy interior, complemented by cosy fireplaces, first floor balconies and an open rooftop bar to watch the world go by.